Forward Donnavan Kirk (22) collects 14 points to help the Hurricanes earn their 10th win of the season. ATLANTA (AP) — Freshman point guard Manu Lecomte seems to be maturing at just the right time for Miami. "You need a guy like that to handle the ball, who won’t make mistakes and runs the team," teammate Rion Brown said. "He’s getting better and better each game." Lecomte scored a career-high 16 points, Donnavan Kirk added 14 points and Miami used its tight zone defense to beat Georgia Tech 56-42 on Saturday. The Hurricanes (10-7, 2-3 Atlantic Coast Conference) showed why they rank ninth in the nation in average points allowed, causing Georgia Tech to miss 27 of its first 35 shots from the field. Miami gave the Yellow Jackets hardly any room to dribble inside the perimeter. Those few times that Georgia Tech managed to get through, the Hurricanes often stripped the ball away or grabbed a defensive rebound. Trae Golden, despite missing six of seven 3-point attempts, finished with 12 points for the Yellow Jackets (10-8, 1-4), who used an eight-man rotation following injuries or sickness suffered by Robert Carter Jr., Jason Morris and Solomon Poole. "We have some guys who haven’t shot the ball as well as obviously we would like," Jackets coach Brian Gregory said. "It’s kind of a double-edged sword. They’re hard to score on — they’ve proven that — and when you have open shots, you have to make them." The Hurricanes never trailed after Lecomte’s layup made it 7-5 early in the first, taking their first double-digit lead on a pair of free throws by Lemonte with 3 seconds left before intermission. Brown had 12 points for Miami, which finished with just four assists as most of the Hurricanes’ baskets came off the dribble. Georgia Tech, which began the game with the nation’s 11th-worst shooting percentage on 3-point attempts, finished 4 for 20 beyond the arc. And Chris Bolden sank further into his season-long slump. The starting sophomore guard went 0 for 5 on 3s and is now shooting just 25 percent on 52 attempts. "We’ve got to shoot the ball better," Gregory said. "We’ve got to move the ball better and just keep plugging away. Miami took charge of the momentum with an 8-0 run to end the first half. By the early minutes of the second half, the Hurricanes had outscored Georgia Tech 16-4 in the paint. Lecomte and Brown hit straightaway treys that helped push the lead to 37-19 during that stretch, but it seemed strange that Miami won despite three assists from Lecomte, one from Garrius Adams and none from anyone else. 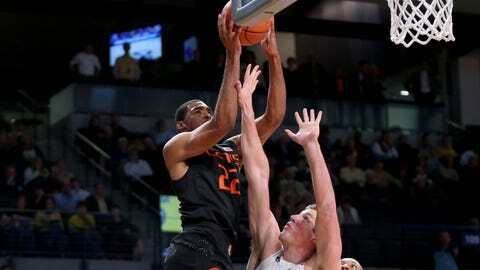 "I was really surprised about that," Miami coach Jim Larranaga said. "It ended up coming down to that Manu’s baskets came off the dribble, Donnavan Kirk’s baskets came off the dribble, and those are the guys who did all the scoring — them and Rion Brown." Georgia Tech shot 29.5 percent, marking just the fifth time since 1964-65 that the Jackets had such a poor performance from the field. Though Miami has held opponents to 60 points or less in 10 straight games, Lecomte said that Larranaga is still far from satisfied with the team’s zone defense. Larranaga, who installed the scheme before the season, used mostly man-to-man defenses during his first 29 years as a head coach. But for a freshman like Lecomte, who last year was in high school as Larranaga led the Hurricanes to the Sweet 16 in his first season at Miami, there hasn’t been much of an adjustment. "Every day at practice, he is always telling us that we’ve got to get better on defense," Lecomte said. "I think we played good tonight."